Occasional Toronto: April Theme: "One Colour"
The April theme for the City Daily Photo Blog community is One Colour and my submission is this wonderful vintage fire truck which I photographed at the St Patrick's Day parade on Bloor St. All of the trucks and other vehicles of the Toronto Fire Services are red and it seemed like a suitable colour for me to feature. Taking part in the theme One Colour. To see more examples from around the world click HERE. With all these photos of the parade, I really wish I could have seen it. That was some parade! And this is a great theme day post; that beautiful machine looks like something from the late 30s. Great choice in super red! 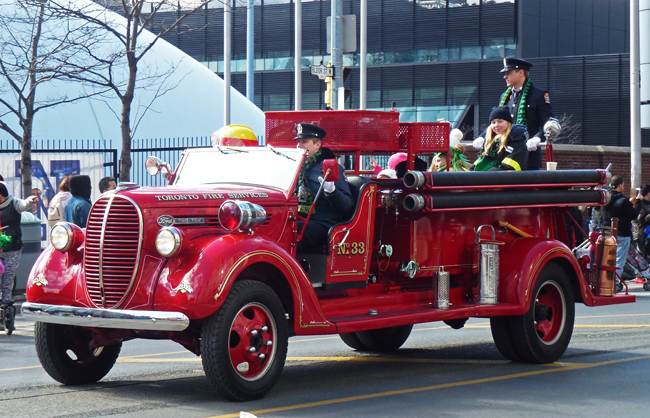 A fire engine in a parade brings a smile to spectators, and it is a perfect image for the day. Have a happy April I--enjoy the day! Why is vintage always so much better Pat ☺ love this gorgeous old beauty! that's a good choice, dear! Wonderful post for Theme Day! I always love seeing anything red. That is a beautiful old truck that has been lovingly maintained. It almost sparkles. I've always loved these old fire engines. It's my favorite colour too and a great choice for the theme, Pat. Is there anyone who doesn't love red? What a great vintage firetruck. Nice to see that it still runs. Well, if you call yourself RedPat, it's only natural to show something red! And this is delightfully bright. That is a wonderful 1938 Ford Firetruck. This is one of my favorite years for old Ford trucks. Good photo. Perfect fit for the one color theme. The red of the fire truck does really dominate the photo, but the bits of the other colors add some contrast. aren't these old trucks the best?!! great choice!! Me gusta. Es un coche muy antiguo. Beautiful old truck, and wow what a nice April it is for you! A great shade of red! Only Red is permitted to RedPat when the theme is One Color!